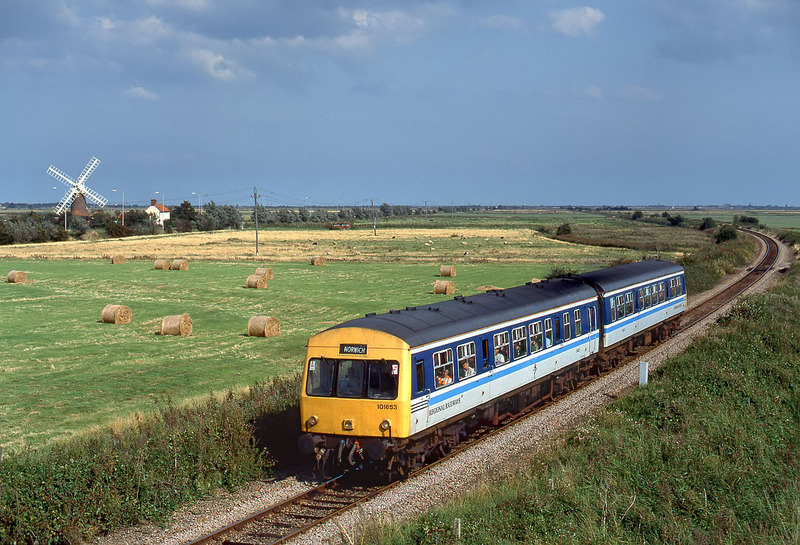 With the 1883 built Stracey Arms Drainage Mill prominent in the background, 101653 (51426 & 54358) crosses the flat expanse of Halvergate Marshes with the 15:20 Great Yarmouth to Norwich Regional Railways service on 29 August 1992. 101653 managed to survive into the 21st Century, one of the few 'heritage' units (as they had by then become known!) to do so. At the time this picture was taken the unit was allocated to Cambridge depot, but like the other survivors of the class it migrated to the north west for its final years in traffic.